Leaving the sunlight-flooded corridor of the Arcade on Westminster Street to step into the Lovecraft Arts and Sciences store is like stepping into another world. The lights are dim and the walls are dark, allowing the spotlit cabinet curiosities to stand out. A bizarre stuffed creature made by a local artist dangles from the ceiling and frightening busts glower at visitors. Even the store’s owner, Niels-Viggo Hobbs, one can imagine as a classic Lovecraftian conjurer who dares to wake the Old Ones. The small shop seems good for a quick browse, until that browse begins and becomes an epic journey. Books line the floor-to-ceiling shelves, and the range of titles is vast — horror, science fiction, weird fiction, New England folklore and history, the supernatural, science, astronomy and archaeology. Original art, prints and bumper stickers are also for sale — does Cthulhu lie dead and dreaming of rush hour? — and a selection of t-shirts line one wall. They come in both adult and youth sizes for the little Lovecraftians, of which I’ve found there are a surprising number. The supposedly unpronounceable name “Cthulhu,” one of the Old Ones, easily trips off the tongue of nearly every young one I know. Kids are creepy. Hobbs was one of those creepy kids who first encountered Lovecraft at a young age. “I really appreciated how he envisioned weird things and monsters. It was so different from the way others depicted them. I lived by the ocean, and I always thought monsters were far weirder than how Hollywood depicted them,” said Hobbs. Understanding kids’ appreciation for darkness, he provided them with coloring pages depicting Lovecraft’s monsters at his table at AS220’s recent FooFest. One can’t help but wonder how many of those monstrosities are now gracing family fridges, lurking beneath sweet self-portraits and drawings of rainbows. 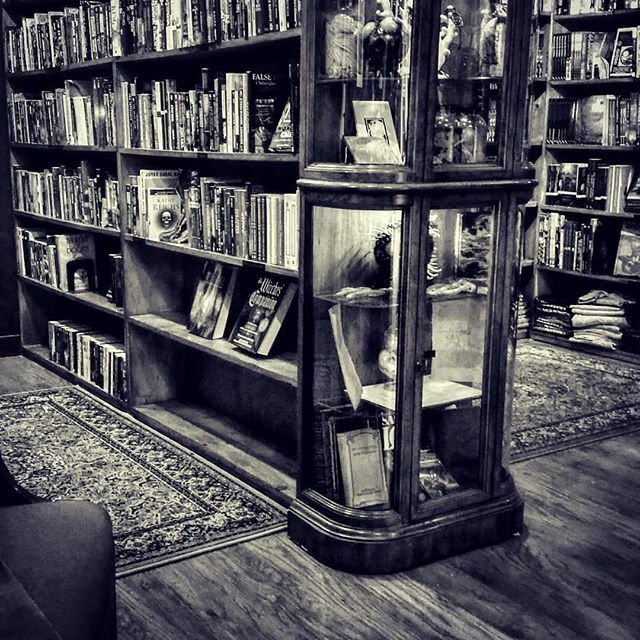 During a recent visit, I realized the shop’s role as a gathering place for Lovecraft enthusiasts. Devotees and the just curious alike wandered in to browse or to chat, certain that they had at least one thing in common with each other. One memorable man stepped in and simply stood in the middle of the store, slowly turning in a circle, unsure what to examine first. And his hesitation wasn’t at all surprising. 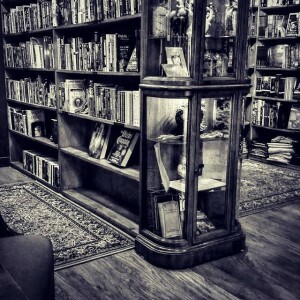 This store provides plenty to fuel the imagination and put a chill in your soul that remains, even when you emerge, blinking in the bright light of day.